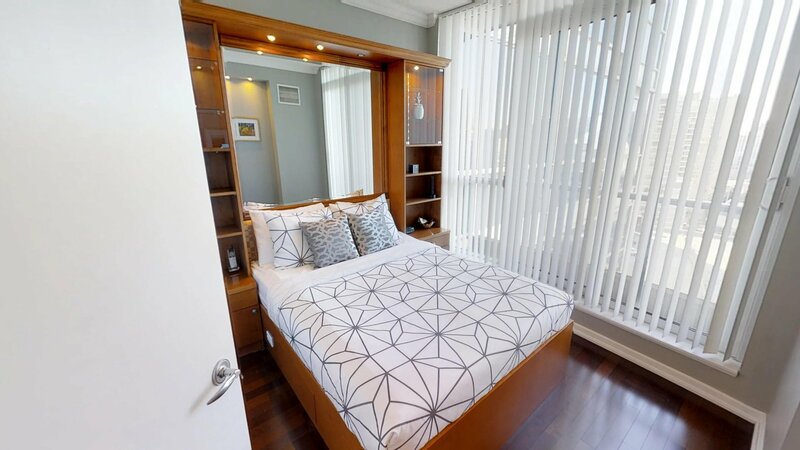 This bright one bedroom Toronto furnished rental offers everything that a traveler would need. This suite is bright and inviting, with big windows and great views. 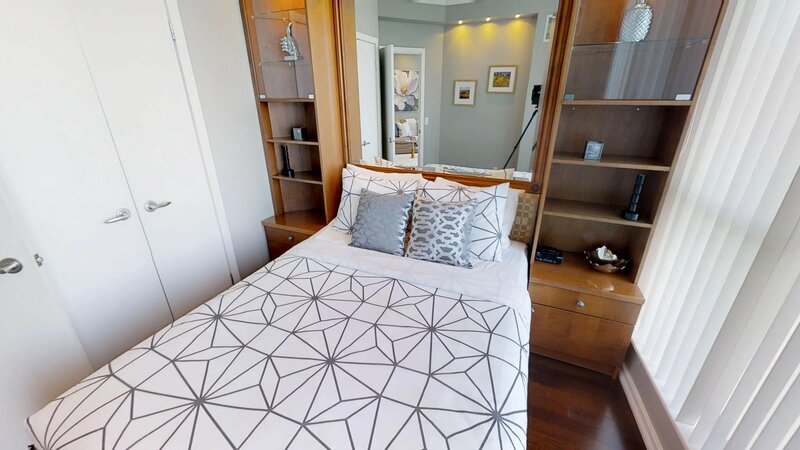 The Bedroom offers a comfy queen sized bed and plenty of storage space. 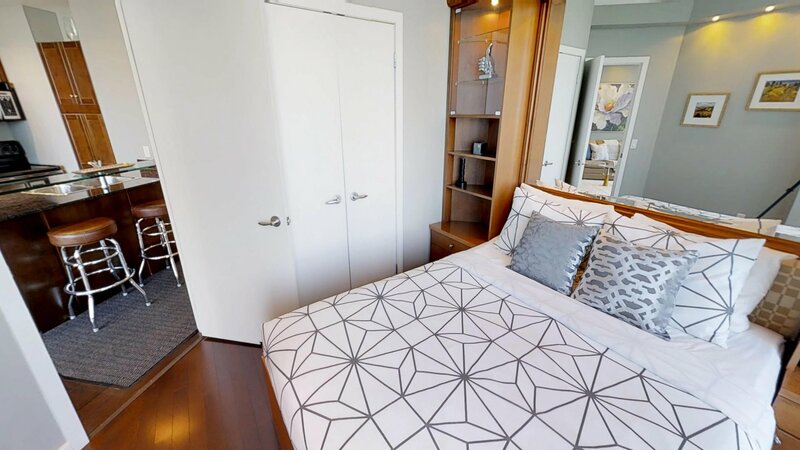 With a full sized closet and built in storage space, there is plenty of room for clothing. 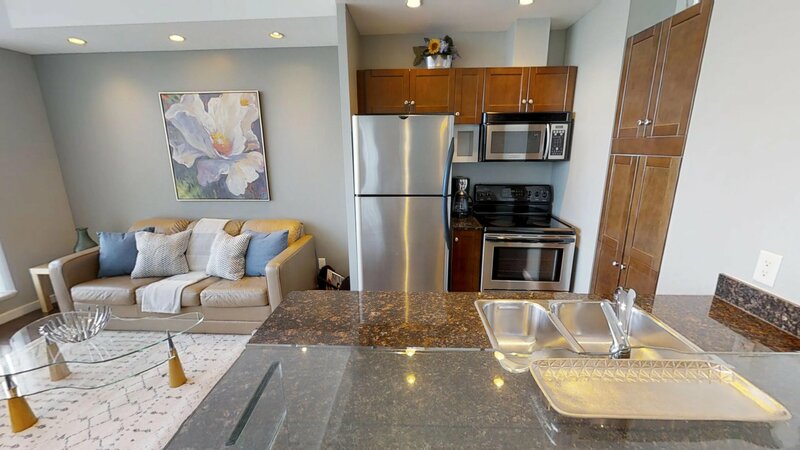 The open concept kitchen and living area has ample space and receives plenty of natural light.The kitchen has granite counter tops, a breakfast bar with two stools, full sized appliances and is fully stocked with all of the kitchen items you need: pots, pans, dishes, cutlery, glasses and much more. Some added touches include a blender, a food processor and a coffee machine. 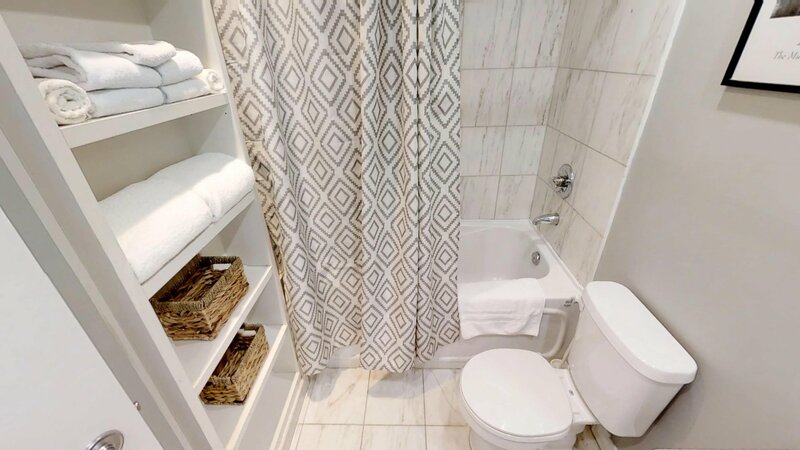 The fully furnished apartment also has a full-sized built-in clothes washer and dryer. The living room is where guests will find the full effects of the suites furnishings, the living room is equipped with a leather sofa bed. The open concept and large windows will draw in light throughout the day. The wall mounted flat screen TV can also be seen from all corners of the room making the space ideal for entertaining. Situated in the heart of Toronto’s gorgeous Harbourfront community lies our executive furnished rental suites at Waterclub condos. What was once an industrial port neighbourhood in the early 1900’s is now a bustling and active residential community with a strong ties to its past. The neighbourhood is extremely easy to navigate, as it boarders directly on Lake Ontario and features numerous east to west access ways. 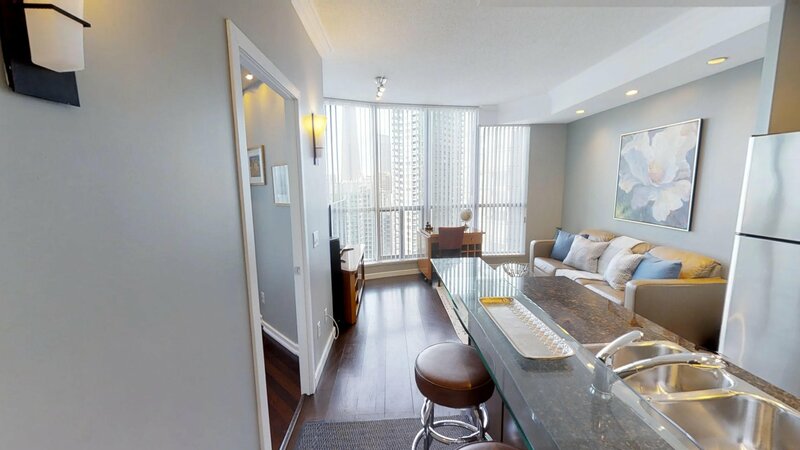 For short term furnished rental guests who are travelling to Toronto for work, the suites are located a mere 10 minutes’ walk to the south of the financial district. If the office is a little further, guests can enjoy direct access to the Queens Quay TTC streetcar, with a stop directly in front of the building. This streetcar runs east to west, with Union Station as the final stop to the east, from which guests can access the subway and the underground PATH system. To the west, the streetcar runs to Exhibition station and Spadina station to the north. For getting around on a daily basis, the building location boasts a near perfect walk score of 97/100 and a perfect transit score of 100/100. 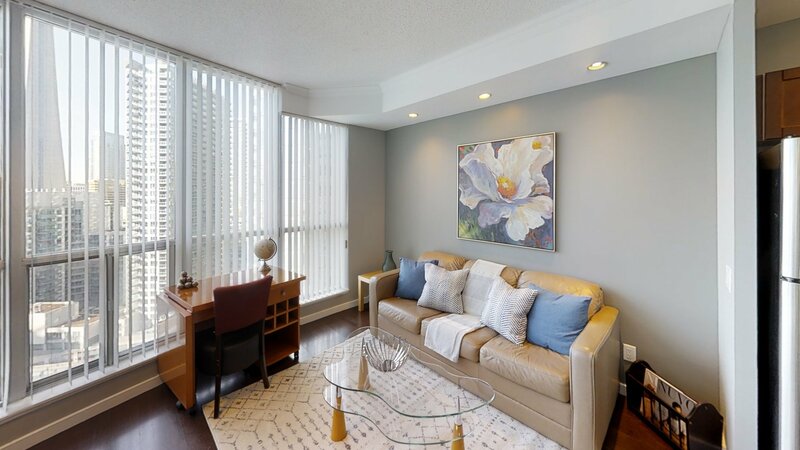 This means that whether it be shopping, dining, banking, daily errands, or even just getting to and from the office, everything you could possibly need is just a short walk or TTC ride away. One of the Harbourfront’s defining features is its many beautiful parks and outdoor green spaces that are scattered along the waterfront. Some of the most notable parks include Toronto Music Gardens, Little Norway Park, Sugar Beach, HTO Park, and more. Most notable for its beauty, the Toronto Music Garden is a guided path style garden park that takes visitors through the different stages of a musical piece. This includes the crescendo, dal niente, the marcato, morendo and more – each a different feel and experience of natural beauty through the landscaping of the gardens. The Waterclub condos have one of the largest amenity complexes in the city. With over 5,000 square feet of gym, our furnished apartment guests can enjoy the cardio area, the free weight area and the yoga room. The building also features an indoor and outdoor pool that can be enjoyed in the winter and/or summertime. The outdoor pool is surrounded by a tanning deck and BBQ area where corporate guests can enjoy a mid-afternoon BBQ and pleasant views of Lake Ontario. The main lobby at Waterclub also includes a roundabout for kiss-and-ride pick up and taxi, accented by a large waterfall; this area provides guests with easy access for pick up and drop off. For additional peace of mind, the building is equipped with double fob entry and 24 hour security; the building requires fob access to enter the building and access each floor from the elevator. This means that only residents and guests can access the floor they live on.